Since the past 4 years i have been working with contemporary dance company Les Pas Indispensables on the project 'Inmost'. Here in France we have finally completed the piece and have performed it on stage in Paris during April 2018. You can find out more information, videos, links, images and music here. New Album 'NIDELK' out now. I've been releasing my songs since 2007 and during that time have cultivated a strong connection with my listeners and fans. Having put out my last two albums with the assistance of crowdfunding, I've been lucky enough to feel the full support of my supporters. It is for this reason I and reaching out to you again in the beginning of my 3rd full-length studio album. The album name and story came from a dream. After my grandfather had passed away he came to me in a dream and kept repeating this word ‘Nidelk’ to me. I wasn’t sure what it meant so i had to look up its origin. The first thing I found was that it was a riddle. I couldn’t believe it. I unraveled the letters and found the word ‘linked’. From this i knew right away that my grandfather was sending me a message that we are both still linked, his world and mine. The more I thought of it in relation to my thoughts of spirit and nature connectivity, I was so happy he gave me insight & inspiration into exploring this universal ‘link’ in my new album. Thanks grandad. From this idea i have been writing from my own personal experience and I have almost finished writing 10 songs for the album. After the songs have been recorded i’ll be mixing and mastering the tracks. Once the album is finished i’ll be asking you to choose which songs you prefer to have produced into professional music videos. Nidelk will only be released digitally as I have decided to stop pressing and distributing physical albums for environmental reasons/ concerns. I found that by using a platform such as Pozible would allow me to stay connected with you all and release music based on your demand. Choosing to only distribute digital downloads is a more sustainable way to release music, respect the planet, reduce consumption and allow you to share the music wherever you want to. If you decide to support this new album you'll be receiving the music aswell as some great rewards I have created. Choose any from the list, eco handmade gifts, recipes, handmade yoga mat bags, gifts, secret gifts, house shows, music galore... And more. Thank you for taking the time to read my campaign and i look forward to sharing this with you very soon. I'll also be touring this summer June-July in Germany with my band Riddle & The Stars/ You can check out all of our dates via my website. Check this beautiful video made in France for the song 'eyes closed'. This was choreographed by my partner Vivien Letarnec & Camille Lelu. Both feature in this music video and worked so passionately for months. They are such wonderful strong and physical dancers, such magic to watch. Directed and filmed by Eytan Jan. I love this and am so happy to share it all with you. 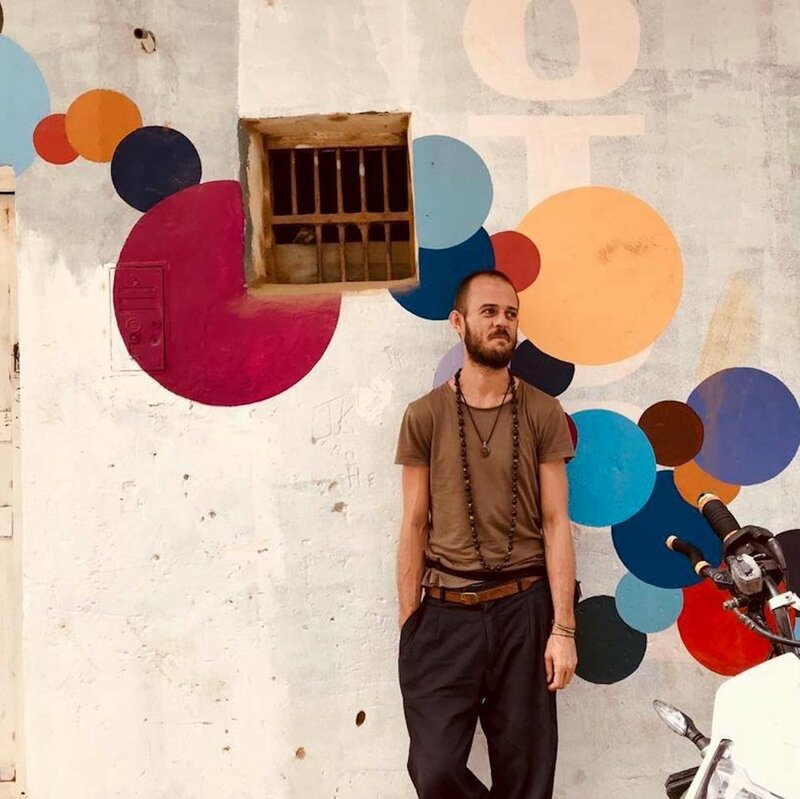 Known for his powerful vocals and captivating sound, singer-songwriter Ben Riddle has drawn favorable comparisons to the likes of Jose Gonzales, Thom Yorke, and Bon Iver for his earthy, energetic and versatile style. With simple lyrics and a natural acoustic underlay, Riddle's music is at once both private and universal. As a country boy, growing up on a farm in rural Australia, Riddle climbed trees, dug for treasure and excepted old trophies pretending that he was Johnny Cash, but he didn't take music seriously until he was in his early 20's. Buying his first acoustic guitar and teaching himself at the age of 19, he found a special connection with all the melodies and ideas spinning around in his head and a way to fit it all somehow to music. Rooted in folk style melodies, Ben’s songwriting is rich in harmonies and storytelling, whilst remaining an unpretentious and organic authenticity. For Ben, the recording process is where the songs really come to life. It is layering and building this musical picture for you to hear, complex with multiple harmonies, experimental percussion, and interweaving guitar sections to produce somewhat of a journey in each song. Over the past 8 years Ben has toured Internationally in Europe, USA, Turkey, Asia and the UK. Ben has released over 7 solo studio records to date and has successfully crowdfunded his previous album Free As A Bird in 2015. Ben also tours internationally with collaborative alternative country folk music project Riddle & The Stars. Ben Riddle returns to Europe every summer touring solo and performing with his collaboration project Riddle & The Stars, an alternative contemporary folk-rock band. “Ben Riddle will capture you with every performance. A brilliant performer, songwriter and creative engineer.” James Flanagan (Radio National). “Free As A Bird is an outstanding album from one of Melbourne’s’ finest independent artists.” Lilly Taylor (NowMusic Magazine, UK). "...so breathtaking that you never want it to end. Free As A Bird never turns into cheap sentimentality, and is clearly the work of a songwriter who has a lot to be happy about. It's a romantic experience." Nick Milligan (Reverb Magazine, AUS).